Simplify and Breathe – When life becomes too much you simplify and breathe. Searching for a gym around Bekasi, Indonesia takes a bit of effort and perseverance. To make it less tedious, I go by these criteria: clean, equipped with basic equipment or more, no latching onto my bank account, no aggressive sales personnel, and knowledgeable general instructors and personal trainers. I was set for a reconnaissance of Celebrity Fitness housed at Metropolitan Mall years ago. I was told it was a good gym, taking it to mean that it was clean and complete in equipment. What I hadn’t counted on, after being held up at the reception area, was the inordinate badgering for my bank account number before they’d allow me to go in for an inspection. I just walked away. Gold’s Gym was next. I was thrilled that a branch was opening at my area and in a mall, Grand Metropolitan, so I eagerly approached their pop-up booth at the mall to sign up as a future client. Big mistake! People were calling me regularly, harassing me to sign up for a year even though the gym wasn’t ready yet. Their modus operandi of pre-selling and locking in people for a year through credit card payment didn’t go down well with me. I dropped the plan of enrolling altogether at the gym, which opened several months later than their announced opening. Helios at Cyberpark Bekasi was where I ended up. Although strategically located in an IT mall, Helios was nondescript compared to the first two. However, the space was big then, fitted with an array of equipment, and offered several classes ranging from spinning to Muay Thai. Payment was looser comparatively speaking – you can choose how to pay without being coerced to pay for a year. No problem with freezing your account too for work or personal reasons; you just tell a staff at the reception counter and it is done. Attending more than one spinning class or zumba or modern dance was allowed. Unfortunately, the gym downsized, cutting its space into half, which had minimal impact on one’s workout, but management became lax so cleanliness levels dropped as well as equipment maintenance. Lighting became poor; buckets on the workout floor due to leaky ceilings became almost permanent fixtures; and the cooling system was always conking out. The push factor in leaving the place altogether was when the owner decided to relocate to an area that would extend my usual travel time of 20+ min to get to the gym by more than an hour. “I’d be too tired to work by the time I got there,” I thought. My trainer wasn’t inclined to move either with Helios and transferred to a nearby gym. My trainer moved to Go Fitness, a much smaller gym catering to the residents of Apartemen Mutiara, but was also opened to the public. It wasn’t in a mall, but it was a stone’s throw away from Metropolitan Mall. The workout space is an eighth of Helios’ but it had the basic weights equipment. Cleanliness was commendable seeing a staff sweep the floor and clean the machines, wiping them down with a wet cloth, almost every time I was working out which was four times a week. Music was not ear-jarring and the ventilation was adequate. But what a difference a year makes for everything had slid down horrendously. For instance, the staff were either sleeping on the sofa at the reception area or smoking outside of the entrance hence the overall dirtiness of the gym. The receptionist was intermittently ill; she was perpetually wearing a disposable surgical mask. Dangdut blasted from the speakers which commingled with a soap opera blaring from the sole TV on the wall. 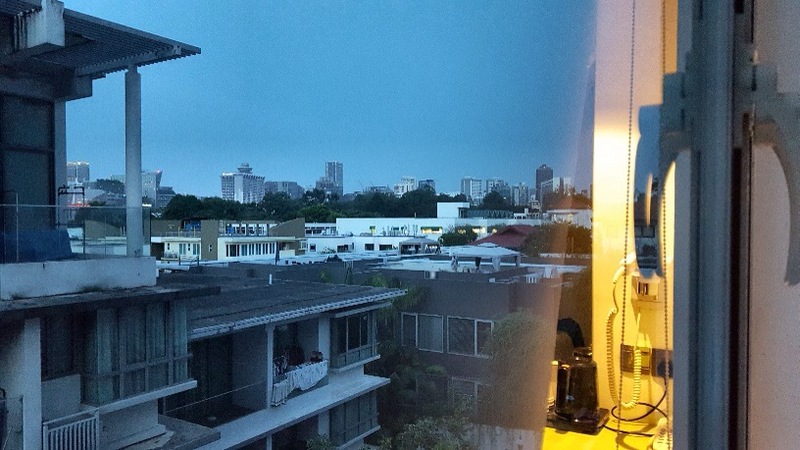 A constant thought that zipped through my mind every time I was working out was, “Was I in a gym or a ramshackle neighbourhood?” It was time to move out. It was a fortuitous event when my desire to move out coincided with my trainer being invited to work at Osbond Gym, an expansive four-month-old gym operating out of Mega Bekasi Mall. The gym floor is wide and divided into areas. There is the general floor – the first floor – fitted with the free weights machineries alongside several treadmills and cross trainers. The side wall is dedicated to barbells, dumbbells, and benches. The second floor is the shared area between the professional bodybuilders and those undergoing personal training which is separated by a railing. Popular tunes make working out a cinch and ventilation is sufficient for you to break into a sweat, but without feeling like your energy is being drained away. Lighting is adequate, naturally and electricity-powered. Water fountains, cleverly housed in red boxes at the sides of the entrances to the men and women’s lockers, help reduce the plastic waste. Cleanliness is paramount with the janitorial team mopping and wiping regularly, and polishing the machines. And I was fortunate enough to have chanced upon a membership promotion that didn’t burn a hole in my wallet. Off the gym floor, the women’s locker room is a haven with its sauna, and clean shower cubicles, toilets, and floor. Agus’s smile says it all. He is proud to work at Osbond and eagerly urged his clients, like me, to transfer with him, which I did. He is like a kid in a candy store with all the equipment he can incorporate into my workout: kettle bells, complete range of light dumbbells, slam balls, medicine balls, health club step, battle ropes, BOSU balance trainer, ViPR, and power bags alongside the other machines. Which treadmill or cross-trainer shall I use? It has been two weeks plus since my relocation to Osbond Gym, and working out is going swimmingly. I look forward to hitting the gym floor to lift, push, pull, squat, row, swing, and curl. Lesson learnt: choice of gym matters. A well-managed gym filled with a competent staff and motivated personal trainer is a good road to trek when on a fitness journey, both physically and mentally. Her friends were excited about the dessert station which they had passed on the way to their reserved table. She, on the other hand, was conflicted, tortured even. She questioned her about her agitation and she revealed that she was on this no-sugar diet for more than month now, but had gone on a pastry binge earlier in the week. She was now trying to get back to her strict no-sugar diet. I then asked her if she was exercising; she said not really. I dropped the subject not wanting to engage in a debate on good food versus bad food. Later in the evening, she was digging into a cup of mousse not caring about her no-sugar diet. Her predicament struck a chord in me. Decades ago, it wasn’t just dessert that had me conflicted every time I would eat. Even eating regular meals posed a problem with guilt accompanying every bite I took of breakfast, lunch, and dinner. Horrors if I even had a snack! It was a vicious cycle of eating meals and dessert, and feeling guilty all throughout that I would rush to the gym the next day and “purge” myself by going on treadmill and doing light weights. Back then, I was not cognizant of the correlation between eating correctly and simply the importance of food in an exercise routine dovetailed with a correct mind set. My mind set then was eating less to the point of starvation to get reed thin. It was such an enervating and unhealthy fitness regime that, on hindsight, makes me wonder to this day how I survived. Body shaming was something I had lived and still living with in a culture mired in contradictions. Generally, Filipinos have this frustrating fixation of a Filipino woman’s body being reed thin like an American or European woman. Any curve or jiggle or love handles is completely sacrilegious to this flagpole-structure of a body that should have incongruously a well-endowed chest. Go figure how this is naturally possible. Dovetailed with this obsession with thinness is the downplaying of one’s healthy appetite especially of a woman’s unless you are convalescing. The logic gets all twisted. You see, not plying your family and guests with food despite the polite refusals goes against the cultural edict of plying your family and guests with food because being thin is unacceptable. These contrasts are more than enough to get your fitness regime all tangled up! Fast forward to now: food is no longer my enemy. It is now a matter of making wise food choices and taking note of my energy expenditure and the calories I consume. I love to lift heavy so I do need to eat right. However, no counting macros for me because I also want to have a healthy mental state. Admittedly, I do overindulge every now, but the guilt level has gone down tremendously. It is all about enjoying the pleasure of dining alone or with friends. It is purple yam to the rest of the world. It is ube (pronounced oo-beh) in its different forms to Filipinos. Growing up, halayang ube (thick ube pudding) was the sole form of ube I knew. It was a special treat hand carried by a relative from my father’s hometown of Calapan, Oriental Mindoro to Manila. My then younger and stronger uncle had the sole responsibility of stirring the mixture by hand for hours until he got the right consistency. Prior to the stirring, he also had the privilege of grinding the ube to bits by hand with the stone grinder. Using a mechanized tool, he felt, to grind and stir was simply blasphemous because it interfered with the taste somehow botching up the chemistry of the ube. My uncle’s homemade ube was not bottled like the commercial ones. It came in a llanera, container for leche flan, and, using a service spoon, we’d scoop a dollop or two on a plate to eat it. I usually ate it straight from the serving spoon, so the next one had to get a new serving spoon. A meeting with old friend Harriet led me to two forms of ube. One was a reworked version of the traditional Filipino dessert-snack, halo-halo. The second was a fusion of Western and Filipino desserts. Halo-halo is a cold concoction of layered goodness. The first layer of a usual parfait glass is a bed of coconut preserves in its various mutations, sweet red and green beans, and rice krispies at the bottom of the glass followed by shaved ice generously drizzled with evaporated milk. The final layer is a topping of cubed leche flan or a dollop of ube or a scoop of ice cream or all three toppings sitting prettily on a hill of ice. The reworked halo-halo I stumbled upon was at Bench Café. Located on the second level of Greenbelt 3, it is best to turn left at the Green Belt entrance facing Fairmont Hotel and follow the path. Walk a bit slowly once you pass Starbucks while looking to your left – look for a flight of staircase curving up to the second level. Bench Café is an offshoot of the clothing company Bench, a prominent brand of my high school and university years, which has branched out into the food industry. A craving for ube egged me to walk through the café’s heavy wooden doors, and into a space wrapped in white, wood, and glass, and a black-white floor pattern that seemed to play eye tricks. Bench Café’s halo-halo was an explosion of ube, which was the first noticeable refashioning, in a 16-oz cup. Second, where the halo-halo bits started and ice ended were blurred; the shaved ice had transformed into snow ice much like the snow ice of a Korean patbingsu. The coming together of the ube snow ice with the ube ice cream (or was it halayang ube or both? ), after plunging the spoon into the cup and pulling it up, was one smooth, ube tango on the palate sans the imagined cloying sweetness. Cranking up our ube overload was a slice of their ube leche flan cake. The combination of ube cake – a Filipino take on the regular cake – and leche flan is one of the two fusion dessert trends taking off in Manila. The other transmogrification is pairing ube with brazo de mercedes as done and popularized by baker Bellefleur by Beatrix with her sought-after frozen ube brazo. She has also come out with her own version of the ube leche flan cake in her bake shop in Greenhills. Bench Café’s ube leche flan cake is smothered in cream cheese icing, swirled with ube flowers, and sprinkled with ube bits with each bite a harmonized blend of sweet and sour as the sour cream cheese taste surfaces immediately after the sweetness of the leche flan. 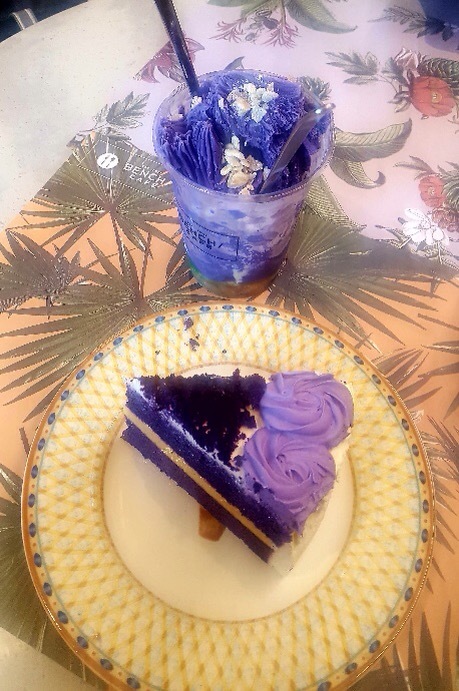 The trick to tasting such harmony is to thoroughly slide the fork from the top to the bottom to get all layers of the cake – ube cake, leche flan, ube cake, and icing – and get the flavors at every bite. Ube overload is an indulgence that I find myself looking forward to every time I come home. It is a trip down memory lane. It is savoring the happy moments in my childhood. It is a sweet surrender to my craving for my favorite Filipino dessert without the guilt. The off- season of the UP Ladies’ Football team was the push factor for my hitting the gym when I was still in university. Being a soccer varsity player was exhilarating. When I tried out for the team, the senior players were sceptical that they even had a wager that we newbies – there were three or four of us – wouldn’t be back for the next training session. They were wrong because we were back for the next session all sore but raring to train. Compared to the senior players, I still had a lot to learn from ball handling to strategies and a lot to develop in terms of stamina and muscular power. So, stoked to succeed as a full-back player, I went to the gym to develop muscular strength so I could kick the ball harder and send it flying across the pitch like the professional football players. My goal was to able to kick it half across the field which would clear our side of the pitch, and make it easier for our forward players – two tall, lean, and nimble ladies – to carry the ball towards the opponent ‘s side. My soccer days are over, but the habit of lifting weights never left me. There is something about the feeling of power surge through your body as you lift those dumbbells or barbells, and seeing how the weight increases every session. That feeling of strength isn’t that obvious while you are at the gym because you move through the exercises continuously which tire you out. And you certainly are not as poised and graceful as Wonder Woman. I know I look like the world caved in on me! I enter another world when I am at the gym. It is all about being focused and getting the lift right. I lose notion of time, the count of reps, work, the gym itself that I am only pulled back into the gym floor when I feel that extra tug at my resolve to dig deeper for that power to lift the barbell off the ground. At times, my personal trainer, Agus, tells me he had increased the weight because of the look of incredulity I flashed him as I, sprawled on the floor, tried to catch my breath. Or when he whispers to me that some of the men in the gym were remarking to him about how heavy the weight I was lifting which, to their minds, is not usual for women. I love lifting heavy although there are days I loathe it because I am either very sore or tired from work. When I lift heavy, I am more aware of my breathing, my body posture, and getting the form and breathing correct to avoid injury. I like my chest and back days – it is so empowering to do push-ups. I am determined to do heavier dumbbell and barbell presses, and to go lower for the push-ups while I enjoy the cable row and the bent over back row. On the other hand, I am not that thrilled about my shoulder and arm sessions, but I know I have to strengthen my weakest parts. I love-hate my leg workout. It takes a lot of determination to get through the arduous squats and lunges, which knock the wind out of me always, but I look forward to doing the leg extension. Admittedly, I brace myself for the Bulgarian lunge because, apart from testing my strength, it tests my balance greatly. Lifting heavy is all about establishing a good relationship with one’s self. Along the way, as the weights increased, I have learned to strive for balance between my professional and personal lives, that one cannot simply overwhelm the other. On a personal basis, I have learnt to have a better relationship with food by choosing to eat better but not to be overly stringent that I, feeling deprived, go on a crazy food binge when the stress level or hormones go out of whack. I also have learnt that prioritizing myself is equally important as being considerate of others’ feelings. Professionally, I have become less of an individualist and push myself to be more of a team player, but without compromising my ethics and beliefs. Lastly, lifting heavily is also my fail-safe plan to stay loneliness, eliminate self-doubt, get strong, and face the vicissitudes of life with aplomb. The myriad choices in food is one of the reasons I miss living in Singapore. Every meal becomes an adventure because the choices are different every day unless you are a creature of habit. Thai cuisine is one of my favorites which is, unfortunately, sorely lacking in Bekasi. When a Thai restaurant opened in Grand Metropolitan, my enthusiasm was cranked up a few notches higher, but a mild case of food poisoning after having their phad thai quickly swore me off the restaurant forever. Bye bye Thai food. Bangkok Jam at Plaza Singapura is one of my go-to restaurants when I am in Singapore. The casual vibe, a plethora of dishes to choose from, affordable prices, and amicable staff are more than enough to make it a habit of mine to dine at Bangkok Jam more than the Vietnamese place a floor below it which, among others, is less inviting. And Vietnamese cuisine is another favorite of mine! This time I had with me my colleague who was equally famished as I was. We gave our students, who we were chaperoning for the Youth Environmental Summit 2019, an hour plus to shop while we had a very late lunch. While Venni tried the tom yum fried rice – she loves spicy food – I had my usual seafood phad thai, a plate of rice vermicelli topped with succulent seafood and bean sprouts. On the side of the plate are mini hills of ground peanuts and sugar. The peanuts I understand – they provide that extra crunch – but I never could wrap my head around the sugar. I have a sweet tooth but not in this manner. The verdict is always the same: craving for Thai noodles checked.